It’s adjusting your dog to a lifestyle in which she can be happy and healthy. This includes socializing. 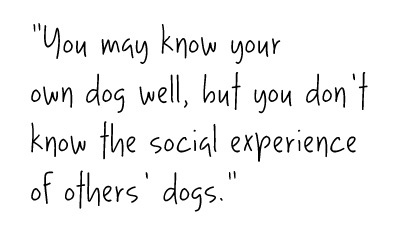 Socializing is basically a fancy term for “taking your dog out into the world”. Think about it – if your dog has spent the majority of her first months in one of three places (the house, the kennel, or the yard), then the first time she’s taken out of that radius is a huge deal for her! There are completely new sights, smells, and people. She had no idea there was a world beyond the four walls of your home. Imagine how exciting (and potentially overwhelming) this prospect could be. Of course she’s going to bark like mad, jump on strangers, and repeatedly try to sprint off in any given direction – she’s curious! This is something to really consider if the first place you’re ever going to try to take her is a crowded local event or festival – that’s the equivalent of diving into the deep end of a pool the second you learn to take a step. Like any of us, dogs need to practice before they can really be successful. This means that WE, responsible dog parents, must help our pets learn how to function outside of our home just as much as inside. And to do this, we need two main things: patience and positivity. Got ’em? Alright, let’s socialize! There are three main things to accustom your pup to – These will help to prepare your dog for most any situation and help her to deal with her external environment a little better. The first thing to practice with your pup is human introductions. Start with close friends or family who are willing to help out. Let them know what you’d like to achieve ahead of time so they don’t accidentally encourage an unwanted behavior. For example, if your dog is jumpy, tell your helpers to not entertain your pup’s jumping. Have them ignore your dog until she has calmed down and is no longer jumping, then allow them to give her attention. Practice this multiple times with as many different people as you can. When you take your dog out, politely ask strangers to abide by the same standards. While it may seem uncomfortable to say, “hey, don’t pet my dog right now,” you can instead try explaining your objective: “We’re trying to train her to not jump up, so let’s see if she’ll calm down for you to pet her.” This way, the behavior is not encouraged and your dog gets practice with people she won’t normally encounter. Other “faces” you should consider acquainting your pup with are other dogs’. Whether or not you’re interested in taking her to a dog park on a regular basis, you’re bound to encounter another canine at some point. It’s important to teach your dog how to interact with other dogs (at least to the greatest extent you can – we can’t control nature) so as to keep both dogs safe. You know your dog best, which means you likely know the level of interaction your dog can tolerate.What you don’t know is the social experience of any other dog. It’s always best to err on the side of caution, staying alert to both dogs’ body language (if you’re unfamiliar with canine body language, you can browse through this WebMD article for some pointers). If you notice her becoming uncomfortable, scared, or angry, remove her from the situation. If she does become aggressive, think about what may have made her snap: Was she protecting you? Was there a toy involved that both dogs wanted? Was she just nervous and afraid? If you can pinpoint something specific that may have kept her from succeeding, do your best to remove that obstacle before introducing her to another dog. It’s also very important to understand that (just like humans) not all dogs personalities are harmonious: simply because two dogs are both well-socialized does not guarantee they will get along. Use every encounter as practice. If you don’t have the time to incorporate your training, try to avoid crossing the path of a passerby until you feel confident that your dog is beginning to understand the concepts. Every time someone (yes, even you!) gives into your dog’s unwanted behaviors, she takes a step back in her training. While it may be difficult in some situations, always be on the lookout for those moments when you can guide how people respond to your dog’s greeting behaviors and how your dog responds to other dogs. Once she understands how to behave around others, it will make going out in public so much more pleasant for both you and pooch. The next thing to introduce your pup to is varying locations. Your home is likely the safest space for your dog, but she may find some places to be more comforting that others. For example, a quiet hike through the woods is a little less stressful than a walk through the noisy downtown of a major city. BUT, she should be exposed to both ends of the spectrum, if you plan to take her out and about with you regularly. Bringing your dog along to a couple of pee-wee football games or to a local summer block party can give your dog a chance to experience a change of scenery. Plus, there will likely be people nearby to practice your “faces training” with. While there are some environments that your dog may not need to become accustomed to, experiencing new settings can be a fun activity for you and your dog. If you’re an exploratory type (and the places you adventure to are dog-friendly), why not take your pup? The more your dog experiences, the better she does when it comes to facing brand new situations. If your dog is often unsettled by loud sounds or large crowds, definitely work up to those bigger, noisier events (or if necessary, opt to avoid those altogether). For example, if you have a child that plays a sport, taking the dog along first to a practice may be less intimidating than starting out with a game. Practices are not as competitive, and generally parents do not stick around to watch as often (nor are they yelling at the coaches and officials during a practice). A practice allows for a smaller scale version of what your pup might experience at a game, and helps her ease out of her comfort zone rather than being pushed out. The final introduction to work on with your dog is introducing her to the usual things she may encounter outside of the home. To you, these are common to what you might see while you’re out and about. But to her, they might be scary, weird, or even threatening. Helping your dog to feel comfortable around those common external encounters will be the cherry on top of this socialization sundae. Some commonplace encounters could be a car, a garbage can, or a snowman. These are things that your pup may not be used to seeing in her own daily routine, and may throw her off her game. The key to commonplace introductions is to let her investigate while keeping it a positive experience. Be patient and encouraging as your dog makes its acquaintance with the recycling bin hanging out by the sidewalk. Also try to understand what your dog may be nervous about. A car (while potentially dangerous if your dog is loose) is not a threat to you and your dog strolling down the sidewalk. However, a large, loud, moving object can be threatening to a dog regardless of the situation (and especially if she’s never seen anything like it!). Keep a positive tone when cars pass by, and encourage her when she does not attempt to chase or bark at the car. A snowman can be equally as threatening as a car, simply because its an unknown to your dog. You know that the snowman will not attack, but your dog can’t be sure from afar. For inanimate (and not dangerous) encounters, allow your dog to investigate herself, praising her as she becomes comfortable with the new object. Overall, just keep the mood positive. If your dog has a negative experience with a person, place or thing, she will likely have difficulty the next time she encounters it. You also must commit to being patient in this process. It may take her a little time to muster up the courage to approach a new thing or relax in a new location, but she’ll get there as long as you praise her progress along the way!